I'm not sure what's more upsetting; the fact that Cobley seemed to be trying to channel Kevin J Anderson in the way he tells this story, or the fact that he failed miserably.I was very nervous coming into this book after finishing the first in the series, and it would seem my fears were justified. Not only was this a let down from the already mediocre debut, but his attempt to set up additional story-lines stumbled and failed.Though the only positive I can say about the way he did create new situations, is that it was leaps and bounds above how he resolved things.It almost feels like Cobley went into this series with the attempt to figure out how he can solve every single problem with a Deus Ex Machina. I can't recall a single problem that came up which was actually solved through the use of cunning and ingenuity.What is amusing about the entire thing though, is that the only real character development we seem to get, is when someone previously left undeveloped, swoops in out of nowhere to solve the problem of another underdeveloped character, and manages to grow a little bit as a person in the process.Maybe that's entirely the point. Perhaps this is a brilliant attempt to show the concept of a Deus Ex Machina as a theme/character of itself, and it is so smart that it completely went over my head.I doubt it though. The troubled sequel to a better book. Not as good as the previous, but hopefully providing lots of 'set up' for the third and final part. The language in this book is so appalling I found the thing impossible to read.Most people, when they buy a cliché dictionary, use it to find annoying phrases to avoid. Mr. Cobley seems to have used one as a resource. Let me give you an idea of just how awful the thing is ... here are clichés from the preface:- In the title, "has gone before"- "ruthless ... enemy"- "far away star system"- "fertile ... world"- "swathed in ... forest"- "ancient secrets"And that's just the first paragraph. Seriously, the first paragraph! There are so many clichés here that he's achieved cliché meltdown: I really, genuinely, cannot read this book. I don't know if this guy is deeply lazy or deliberately being irritating by writing so badly. Whatever, it's impossible to see the story through the awful awful language. This is Douglas Adams' "small lump of green putty found under my armpit one morning". I reckon he's trying to copy the style of early pulp science fiction, but he's not realised that, then, the language may have been rushed and thrown out of a typewriter like smoke from a wheelspin (see, copies are horrible, aren't they), but the atmosphere of that time made the language fresh and exciting, then. Emphasis on the then. But it's been copied, copied, copied, so much so that now it's bloody irritating. It's descended to deepest cliché: any writer who knows anything about his tradecraft should know how clichés build: they're once exciting phrases that have grown tired, so tired they've fekkin' annoying. It's why you have to be wary when reading Fleming: Bond's not written in clichés, they're the utterly copied originals. The same goes for pulp sci-fi, except that was never quality writing in the first place.I should never have bought this book; I was in Foyles at St Pancakes with not much time. It's the second book in a series, and I bought the original because Iain M Banks recommended it, according to the cover. Don't touch it; don't for a moment presume this book has anything like the quality of Banks' works. I haven't got a clue why he recommended it. I tried to read that first book, but the language so irritated me that I ended up skimming it just to sneer and giggle at all the fekkin' clichés this desperately lazy writer invoked. The plot is clichéd too, as I remember, but nothing like in as appalling a way as the language: with non-annoying language it might have earned 2 point something stars.Now, of course, the guy might be using dire language deliberately. He might so hate his readers he wants to annoy them intensely by pelting them with stuff he's grabbed out of his grandmother's toilet. Well, sod that, he can bugger off. The language is so awful that this series, so far, is the worst I'm come across in 40 years of reading SciFi. This is the second book in the Humanity's Fire trilogy by Michael Cobley who, in the interests of transparency, I'll declare as a friend of mine.I enjoy sci-fi in movies but have never read much in the genre (but, then again, I don't read overly much fiction) so this Space Opera represents jumping into the deep end.It's a complex story but it does manage to capture the imagination and kept me interested up to the inevitable climax setting up the final part of the tale. The story jumped from the perspective of one character to the next in a seemingly disjointed fashion until the final section.Looking forward to reading the concluding part. So I was wrong- Vash is just mind controlled. Takes off and jumps off a cliff. Legion takes over the warpwell and send his 2 scions in and reverses it, because the Sentinel was destroyed because it was a raging world class moron or a traitor.Greg gives Cat the magic Z AI and they take things apart. But not on the planet? Useless. Cat disintegrates.Theo shows up with Gideon and asks after Greg and Vash picks up. Cal wakes up in the autofactory and the Pathmaster tells him to get some upgrades, stop resisting and use the machines. A book that has a lot going on. Multiple plot lines, different concepts casually thrown in at random moments, extra races everywhere. I might have to reread it when i get the third in the series just so i don't miss important bits. operatic. in the best way. still not sure about the ultimate powers at war here. I read Mike Cobley's first epic space opera book, Seeds fo Earth, prior to its release last year and thoroughly enjoyed it. The Orphaned Worlds, the sequel and part two of the trilogy, was a highly anticipated release for this year and upon getting a copy through the post I made sure it was high on the list of to-read books. While not quite on the same level as Seeds of Earth, The Orphaned Worlds delivers a whole lot of action, adventure and politics on a canvas even bigger than the first novel!The foundation laid down in Seeds of Earth gets us introduced to the lost colony world of Darien, the surprise arrival of an Earthsphere ship and the discovery of an ancient and powerful relic on Darien as well as delivering an excellent cast of characters that kept the story focused. The Orphaned Worlds picks things up without holding its breath and delivers very much more of the same sensawunda that I got from the first book. The characters return and we follow the trouble and strife they now must struggle through in the face of powerful adversaries.Widescreen isn't quite the term I'd use to describe this book, it goes far beyond that in many ways! From the guerrilla conflict on Darien to the immense journey through the ancient hyperspace layers, The Orphaned Worlds certainly doesn't take things lightly. The characters are also relatable and enjoyable to read, especially as we start to get glimpses of Legion and it's own quest. Greg and Theo are left on Darien trying to survive and lead the attack on the invaders; Robert is on a mission to the ancient Construct deep in hyperspace; Kao Chich is journeying to try and find help for the colony of Darien; Catriona and Chel are learning more of the ancient ways of the Uvovo and the secrets the forest moon of Segrana; Legion is slowly fighting it's battle to free the ancient evil that was imprisoned thousands of years ago. There are also a host of other characters supporting these main ones, including Julia who is a little out of the action after being captured in Seeds of Earth.However, The Orphaned Worlds loses it's focus slightly because of the sheer number of plot threads we follow. While all individually adding to the bigger picture, the pages pass without much feeling of urgency. For instance, the first seven chapters are each from a different perspective and last 90 pages, so when we finally catch up again with the characters it's with a feeling of detachment. I sometimes had to stop reading and go back to remind myself of the situation they were in last time they had some page time - it can be a frustrating read because of this.Don't get me wrong though, The Orphaned Worlds was very enjoyable and delivers a good story on a huge canvas with more than its fair share of great scenes and interesting developments. Being the middle book of the trilogy hasn't helped matters and much of the time it feels like a big build up to a grand finale - without the payoff. Because of this it's very difficult to say how successful the novel is as part of the series, but it certainly gives the reader more than enough to come back for the third installment, The Ascendant Stars.Humanity's Fire is definitely a series worth reading and I'll be eagerly anticipating the final book next year! Definitely suffers from the middle book problem and honestly, it's just not as good as Seeds of Earth. After a promising start, the narrative quickly falls apart. The author is trying to weave too many different storylines together, causing them to feel very disjointed. It is typical of a lot of second-tier space opera in the sense that it desperately needed more vigorous editing. A halfway decent concept is buried under 600+ pages of aimless storytelling and irrelevant tangents and side plots. Unfortunately, the things that do warrant more exploration are grossly unrealized. For example, why don't we know more about the ideology of the Spiral Prophecy? From where do they originate? Why did they choose Darien as a target? Cultists can be a fascinating subject in science fiction, but we are given nothing except for their sudden appearance where they nuke a battleship out of the sky and swarm the planet. Perhaps these questions will be answered in The Ascendant Stars, but I don't know why the author didn't flesh them out more in the here-and-now. All this being said, there were some cool ideas, so I don't want it to seem like I'm dumping all over this book for no reason. Just like in Seeds of Earth the author does a nice job with machine intelligences, sentient ecologies, and ancient constructs. The Sentinel, The Construct, Segrana, the Knight of the Legion of Avatars, and the Zyradin were all very creative characters. I will start The Ascendant Stars tomorrow, although my expectations have been tempered.Also, am I crazy or did Greg use way more Scottishisms than in Seeds of Earth? The second part of a trilogy is always the hardest part of a trilogy.When done right, the effort is always lauded. This is why The Empire Strikes Back is so popular. Despite some obvious flaws with the narrative, the movie never appears to be just wasting time waiting for the denouement. But I think coming up with such a second act is a more difficult proposition than it appears. If, we as consumers are aware that there will be a third act, we realize that there won't be a sense of closure when we finish this work, and that can sometimes leave a bad taste in our mouths.The problem with The Orphaned Worlds is that it just seems like the novel is idling, waiting for the real stuff to happen in the next volume. Even though there are lots of battles and fighting, it's confusing and doesn't really happen to any of the characters we actually care about. This novel is a lot of potential and not a lot of pay off. Perhaps the final volume will make it better in retrospect, but I am not certain of that. I will say, however, that The Orphaned Worlds did not scare me off of this trilogy entirely, as I am on to The Ascendant Stars and hopefully, a satisfying conclusion. The Orphaned Worlds, Michel Cobley´s second book in the Humanity´s Fire series. While the first book was an exciting opening to a new universe, the second installment seems to have lost momentum. In the first book there are some fascinating references to Carl von Clausewitz classic, War, from 1832. The Orphaned Worlds continues this trend where some of the characters discuss the famous German Nazi general Eric Rommel. I love how the science-fiction genre can tie up “real-time” events to a world and plot set in a far future.Still, the war-aspect of this book became a little too much for me. I got tired of reading one battle account after the other. Also, some of the mystique that we were introduced to in the first book (like the guardian of the temple) lost some of its mystery in this one. Holding on to the mystical in a narrative Is challenging, because you don´t want to show too much too soon. I feel like that´s exactly what happened in this second book.Will I read the third book in the series? Yes, absolutely! I feel like the opening of the series as well as some of the characters are still worth following. Surprise surprise, I actually liked this book better than the first book in the series, 'Seeds of Earth' The pace of the book is steady, except near the end where it seems a bit rushed. Mr Cobley does an admirable job filling in additional details, giving us a richer view of this big, complex universe he has created.There are plots within plots, and it's amusing to see various groups of villains getting in the way of each other at times. There are hints here also, of a far more dangerous foe, one dating back far further than the ones we as readers have been exposed to so far. I have my suspicions, but rather than speculate here, I'll read the third book, 'The Ascendant Stars', and see if I'm right.The only thing that really bothers me in this book, (and I'm trying to avoid spoilers here) is that the same technology used to protect one protagonist, was not used to save another protagonist a few chapters earlier. There is a possible explanation, but for whatever reason, Mr. Cobley has left us in the dark. After reading Seeds of Earth I stated that the first third was too slow, and the last third too rushed. But that as I had started the series now, that I would persevere with the second and third book, as I want to know how the story ends.The Orphaned Worlds pace was more even, the cast of characters developed more depth, but I continued to find them annoyingly stereotypical.The continued development of the story, by telling it from a different persons view point in each chapter, although better paced in this book still took too long. But no doubt that is the price that one pays when one sets out to write a three book series, where two would have perhaps enhanced the readers' experience.That said, I intend to persevere and read the third book in the series. I did not enjoy this as much as the first in the series, yet I will read the last in the trilogy, if only to wrap up loose ends. Nods to Banks and Simmons are appreciated. Perhaps I was not concentrating but had trouble following sopme of the groups listed, and could not understand the Spiral groups motivations. The notion of tiers of hyperspace universes was an interesting one, and perhaps the central, best idea in the whole book. Perhaps more should have been focussed on that concept.Nonetheless, I always enjoy reading about teh possible routes AI will take to evolve, and this covered that aspect, at least teh aspect of bio - mech integration. While I ended up enjoying this, I struggled with the pacing. There are some brilliant ideas at work here with a complex array of cultures and alien civilizations engaged in a struggle to take control of Darien and the technology it holds. The pacing just seemed off. As soon as I was drawn in the viewpoint would switch, diminishing the tension and flow of the story. It's only in the last third of the novel when things starting ramping up that the story became truly engaging. The ending is satisfying, but is largely used to set up the groundwork for the next installment. I'm still interested enough to want to see where this is going. I found this book heavy going at the start mainly because there is so much to try and keep up with. Although I'd read the first book there was much more to get to grips with as the plot develops in numerous different ways and locations.It continues the Work of the first book in weaving and latterly bringing everything together nicely so that the scene is set for the final book. The more you read, the more you begin to piece things together and really begin to care about the main protagonists.l can't wait to get started on the final book in the trilogy to see what happens in what is a classic good versus evil drama. It's going to be a bumpy ride I think! Orphaned Worlds kept my interest long enough to finish it (and the third volume in the series), but the story was lacking in character development, the worldbuilding was a bit incoherent and the battle scenes didn't really hang together very well. I didn't really *care* about any of the characters, it was all just a bit meh. Still, it's nice to find science fiction that I haven't read in the library. That's one of the reasons why libraries are worth keeping open - I don't mind wading my way through mediocre books as one day, a hidden gem will appear making it all worthwhile. Cobley's done a great job of avoiding a dull, pointless middle book. Interesting tidbits that were dropped in the last book (in regards to the other two lost Human ships, hence the name of the book) are expanded upon wonderfully, answering plenty of questions while still managing to whet the appetite for more. Interesting new monkey wrenches are thrown into the mix with skill. Definitely looking forward to book three! Alrighty, started this one instead of the first book because this was more highly rated. But, I'm sorry if I'm too harsh on this, I draw the line at any book that wastes about 10 pages on "what has come before." I mean, seriously? We have to be dragged through 10 characters, 5 worlds, many spaceships to get to the Prologue? Any good writer would make that a moot point through the storytelling. So, yeah, not gonna read this one. 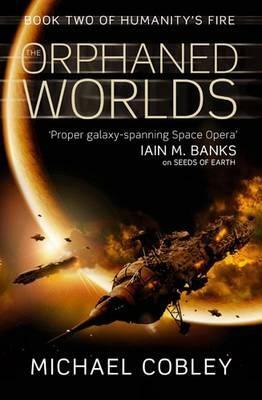 I've been on a a quest for a new Scifi series, something to fill the void left by the Star Wars expanded universe. This series is something else, something really good, something I didn't know I was looking for. This book picks up where the last one left off and keeps moving full bore. Never a dull moment, and all kinds of weird and interesting things thrown at you. Highly recommend the series. Couldn't finish this one. Found myself finding reasons not to spend time reading. I didn't care about the characters and the plot pacing was achingly slow. Sorry, I really wanted to like this series, but I found the first book to be only average and this one went downhill from there. I was just never excited about it. Tries to do way too many things with way too many separate threads. Virtually impossible to follow the story. Volume 1 was mich more tightly organized making me look forward to this installment. I will read #3, just because of my insatiable curiosity, but I sure hope it is easier to follow than this one. Kontynuacja Ziaren Ziemi jest równie przeciętna co pierwsza część. W historii potencjał owszem jest, było kilka niezłych momentów - głównie pod koniec, ale wady pozostały - mało ciekawi bohaterowie, przekombinowane uniwersum, akcja tocząca się w ślimaczym tempie. Do końca doczytam, ale pewnie minie trochę czasu zanim sięgnę po kolejną część. Michael Cobley - Mike Cobley was born in Leicester and has lived in Scotland since the age of seven. Although the Scottish cultural heritage informs much of his own outlook (egalitarian, argumentative yet amiable, and able to appreciate rain), he thinks of himself as a citizen of the world.While studying engineering at Strathclyde University, he discovered the joys and risks of student life and pursued a sideline career as a DJ, possibly to the detriment of his studies. The heady round of DJ'ing, partying and student gigs palled eventually, but by then his interests had been snagged by an encounter with Pirsig's 'Zen And The Art Of Motorcycle Maintenance' which led him off on a philosophical and political odyssey which continues to this day.The desire to write had its first burgeoning when he was 20/21, resulting in the creation of a short fantasy novel (that has never seen the light of day!). He later wrote a string of articles/rants for the campus paper at Strathclyde University under the pen-name Phaedrus, at the same time as he began writing short stories. Mike harbour much affection for the short story form, but has had little opportunity to write them since beginning work on the Shadowkings trilogy.The 1st 2 volumes of the trilogy - Shadowkings and Shadowgod - have been published by Simon & Schuster's now-defunct imprint Earthlight, and the 3rd part - Shadowmasque - will be published by Simon & Schuster-Pocket at the end of 2004. Mike has a number of ideas and concepts for his next big project but they're being kept on the backburner for the time being. The publication of Iron Mosaic will be a personal milestone for him, as well as a showcase of the topics and techiques which have intrigued him since the publication of his first short story back in 1986. And just recently, he has had appeared in the Thackery T Lambshead Guide to Eccentric and Discredited Diseases, with a monologue upon the malady known as 'Parabubozygosia', which is not for the faint-hearted!